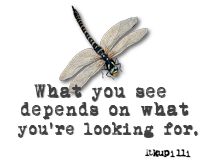 I have been blog hopping almost every night and have been learning so much about other artists, their interests and just generally loving all the ideas out there. It truly inspires me to create more and better. 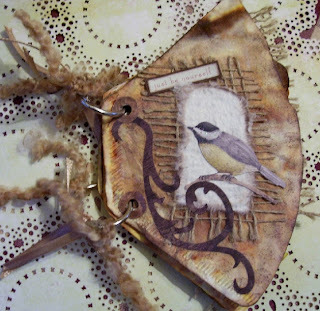 Since doing my last coffee filter book from the idea I got from Gingersnap creations blog I got thinking I would like to do another one about birds. I am too late to enter the challenge, missed it by a day. DARN it. I had the book complete but didn't find out the deadline til yesterday and that was the due date. Oh well, it will sit or be a gifty for someone in the near future. So, I looked for some verses about birds, got my images together then I started making another book. Instead of using Twinkling H20's this time I used Vintage Photo DI as my base colour for the book since I wanted a au natural look and feel to it. After all birds aren't really into flashy things unless you are a hummingbird and attracted to red. 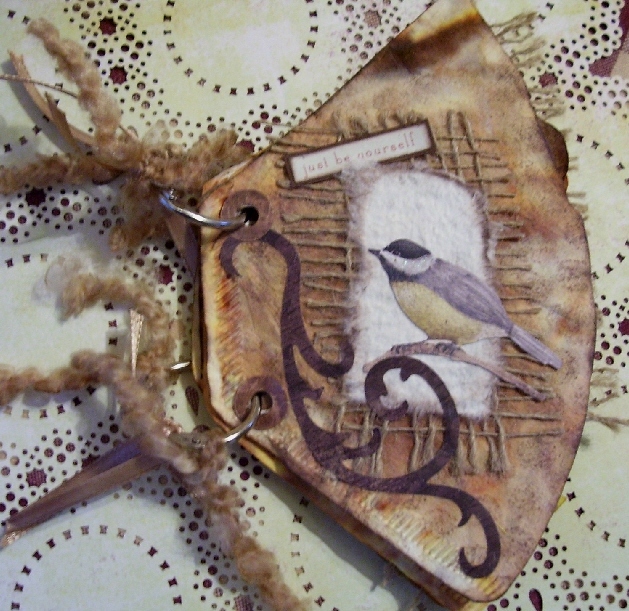 So I stuck with earthy tones in this next book and after looking at another blog I got inspiration to do a Tim Holtz die cut bird cage and later I will tell you where I got the info how to do the cage with some of my own adaptations to it. Not sure if you can see the flower below but I learned how to make these from a really nice lady on Bella Creations named Gloria. She showed us some acrylic flowers and told us how to make them. I did my own thing and didn't make them as fancy as hers but I am really digging these alcohol inks. I find any excuse to use them. I know I need more colours but must wait for another Michael's 50% coupon before I break the bank again. and below are more acrylic flowers with just a touch of colour. Don't know what happened to my blue bird either, seems he doesn't look very clear or bright. Click to enlarge photos a for better views if you like. 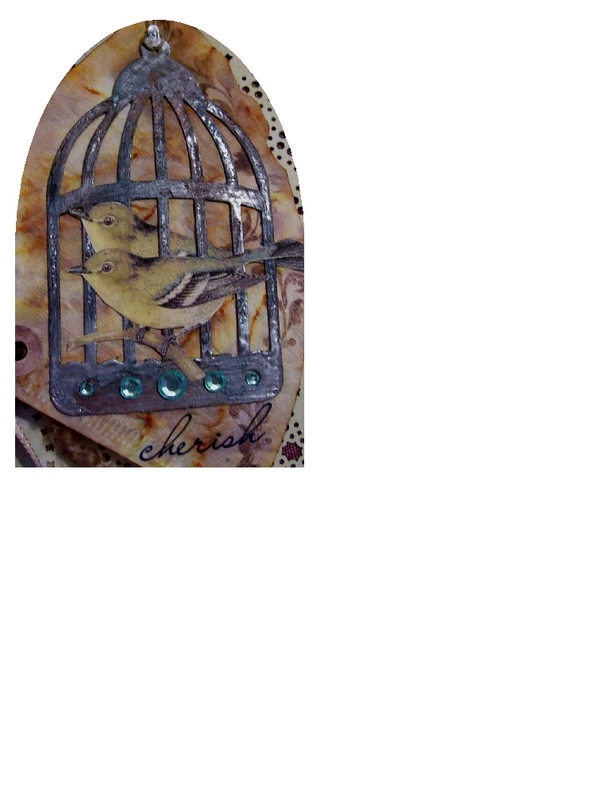 And check out this awesome birdcage. 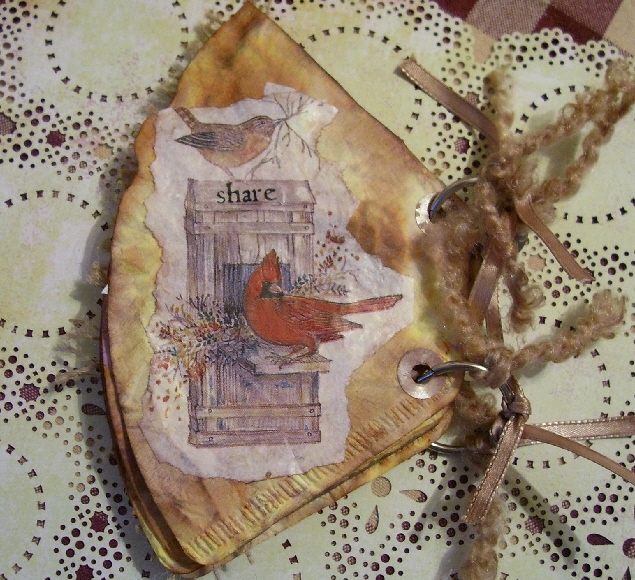 I was taking a break the other night from Blog Hopping on OWOH and went to Gingersnap creations which led me to another OWOH participant over in England who shared her technique to make a gilded birdcage. 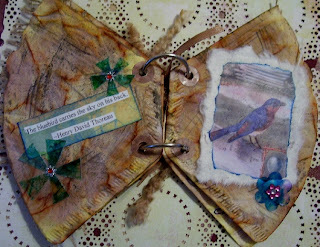 Since I had the Tim Holtz die and most of the supplies I soon went to work on this and fell right in love. 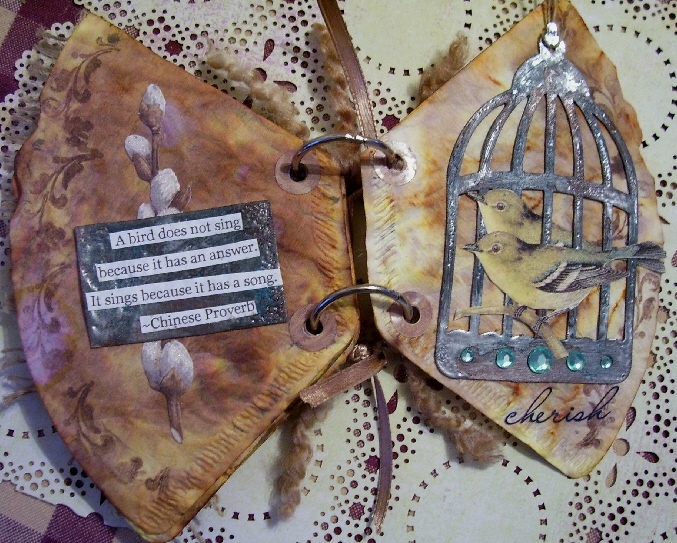 I since have done an antique white cage too, ooooo very pretty and grungy just the way I like it. 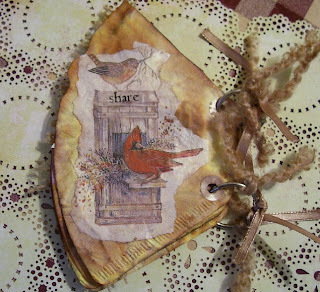 To find out how to do the gilded cage go here to Shelly Hickox over at StampTramp to find out the details. 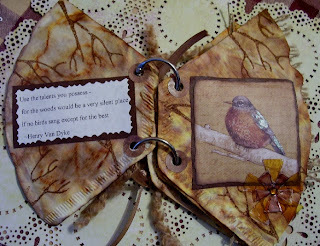 I did not have any UTEE for this but I still used a clear embossing powder and it seemed to work just as well. Another thing I did was while the EP is still cooling and do this quick I used a fine grit sand paper to take some of the EP off in spots. It really works great. I never follow things exactly. I generally get the main idea and use and experiment that way it is not copying exactly. Plus I don't have the funds to run out and buy all the gadgets, supplies and gizmos. At the end of the book there is a close up of the birdcage so you can see it a little better. This last page I used a piece of bird tissue that my friend Jenxo sent me last year. I love all the nice tissues they get over in Australia. Not sure around here where to find the pretty stuff, I only see plain around here or really ugly stuff. Anyways it has come in handy more than a few times. This really looks like metal, I can't believe it. Looks so worn and rusty and been around for ages. 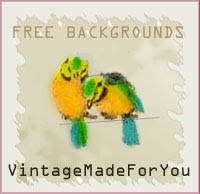 Thanks Shelly for sharing your tut. I love this. Stay tuned for chipboard houses and a matchbox for a swap. Your book is gorgeous!! I'm so glad you were inspired to try my technique. I think it's great that you put your own spin on it too - that makes it so much more personal. Beautiful work! Wow- amazing- maybe I will have to think about trying something like this....really cool! 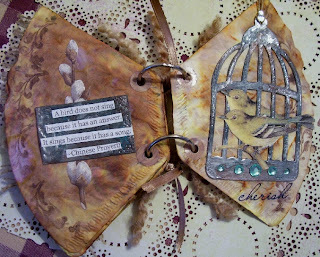 Hi Les, love the earthy tones of your filter book, and the bird cage is amazing! Beautiful! Positively glorious book, Les! You really outdid yourself with this one! Love it. Wow! 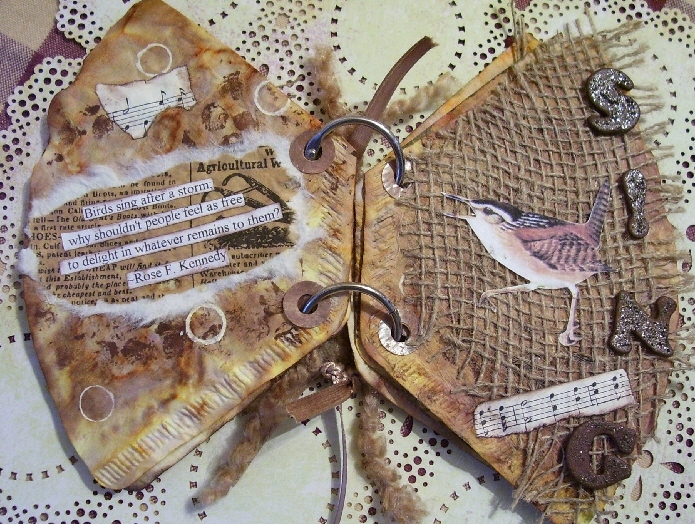 Stunning coffee filter book! Love it! 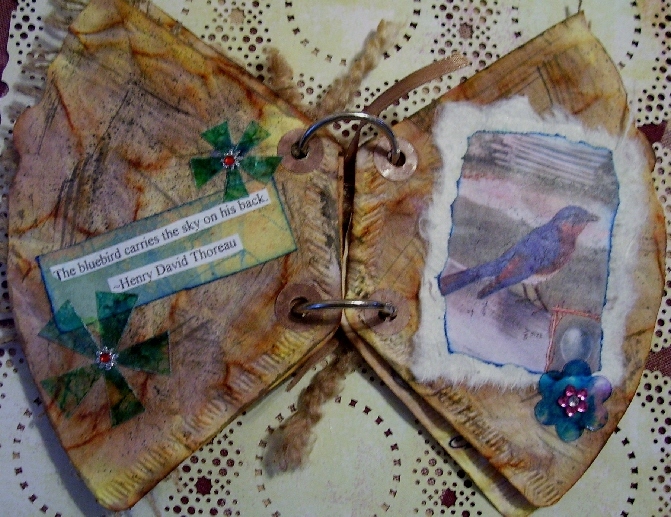 Love it Les.. it's so beautiful... and thanks for the link to the birdhouse technique..